Have you felt the angst of standing under the shower trying to tear a shampoo sachet which simply refused to yield and finally you had to bite it open? Quite a nightmare, isn’t it? One of the most important dimensions of flexible packaging is ‘Convenience’ of handling which also happens to be a pivotal component of the pack’s functionality. The moment this convenience is compromised upon, the utility of packaging nose dives – and simultaneously erode with it, consumers’ faith and confidence and brand image. "As India’s largest multinational flexible packaging materials and Solution Company, one of the commonest asks that our clients have from us is to incorporate easy to open features," says Mr Arun Anand, executive vice-president marketing at Uflex Packaging. 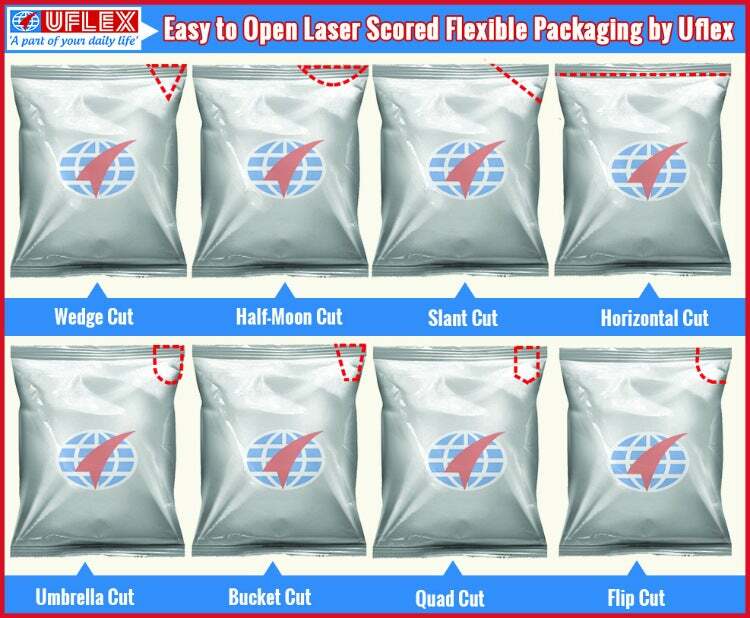 "Uflex has been the first company to introduce laser scored flexible packaging in India. By the sophisticated Laser Scoring Technology the outermost layer of a laminate is incised with laser beams. Virtually every type of incision can be made by this technology. Predefined tearing path is created which guides the end-user to conveniently open the packaging. Commendable is the fact that all of this is done without compromising the barrier properties required by the product packed inside. "One of the conventional tools that have been used to create tearing paths on flexible packaging is serrated cutter fitted on Form, Fill and Seal Machines. This is not considered as a very conducive option as the tool gets worn out with a frequent need of replacement. "With the laser scoring technology we are able to offer a non-contact, clean processing solution that eliminates the need for mechanical tooling or associated consumables. The laser system is capable of precise scoring process that adds accurate features not obtainable through other mechanical methods. This also reduces production downtime, as pattern or design modifications are made rather instantaneously. "The high-quality laser scoring technology that we have invested in provides the ability to precisely and consistently score flexible packaging at controlled depths at varying web speeds. Score lines are created in specified areas of the film/laminate, forming a narrow channel in the material for a tear to follow. Effectively, a laser weakens targeted layers of packaging material to produce score lines without compromising the barrier properties of the flexible film. Various laser scoring configurations like half-moon cut, wedge cut, umbrella cut, slant cut to name a few are possible at our packaging manufacturing plants," adds Mr Anand. "With the help of the value added laser scoring technology we have offered easy to tear flexible packaging solutions to various FMCG brands of snack food, ketchups, condoms, pet food, tea, coffee, rice, spices etc. For a leading snack brand in India, we engineered a three layered laser scored diaphragm (opening) comprising PE/MET PET/PE which has spelled tremendous ease of opening for end-users. The demand for laser scored easy to open flexible packaging has been on a rise not only in India but in overseas as well," concludes Mr Arun Anand. Emphasising upon easy to open flexible packaging, Mr Ashok Chaturvedi, chairman and managing director, Uflex Limited said: "Ease of opening a pack for accessing the product is fundamental to an end-user’s overall experience. Some substrates within a laminate are really difficult to tear open without using a cutter/ blade. "In line with our business strategy of innovation to create value added differentiation to the advantage of our clients, we have invested in sophisticated laser scoring technology that permits perfect incision in a laminate at controlled depths and variable web speeds. This in turn allows the consumers to easily open the pack, adding to experiential delight and upholding the very ethos of flexible packaging."